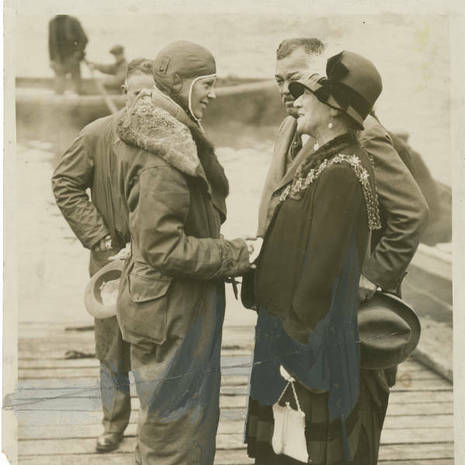 After Charles Lindbergh's solo flight across the Atlantic in 1927, Amy Phipps Guest, (1873–1959), expressed interest in being the first woman to fly (or be flown) across the Atlantic Ocean. After deciding the trip was too perilous for her to undertake, she offered to sponsor the project, suggesting they find "another girl with the right image." While at work one afternoon in April 1928, Earhart got a phone call from Capt. Hilton H. Railey, who asked her, "Would you like to fly the Atlantic?" The project coordinators (including book publisher and publicist George P. Putnam) interviewed Amelia and asked her to accompany pilot Wilmer Stultz and co-pilot/mechanic Louis Gordon on the flight, nominally as a passenger, but with the added duty of keeping the flight log. The team departed Trepassey Harbor, Newfoundland in a Fokker F.VIIb/3m on June 17, 1928, landing at Burry Port (near Llanelli), Wales, United Kingdom, exactly 20 hours and 40 minutes later. 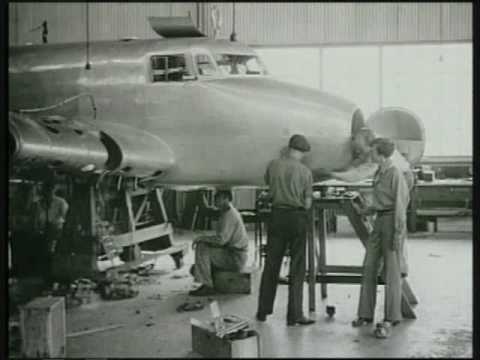 Since most of the flight was on "instruments" and Amelia had no training for this type of flying, she did not pilot the aircraft. When interviewed after landing, she said, "Stultz did all the flying—had to. I was just baggage, like a sack of potatoes." She added, "...maybe someday I'll try it alone." While in England, Earhart is reported as receiving a rousing welcome on June 19, 1928, when landing at Woolston in Southampton, England. She flew the Avro Avian 594 Avian III, SN: R3/AV/101 owned by Lady Mary Heath and later purchased the aircraft and had it shipped back to the United States (where it was assigned “unlicensed aircraft identification mark” 7083). When the Stultz, Gordon and Earhart flight crew returned to the United States they were greeted with a ticker-tape parade in New York followed by a reception with President Calvin Coolidge at the White House. In 1928, Amelia Earhart received a phone call that would change her life. She was invited to become the first woman passenger to cross the Atlantic Ocean in a plane. "The idea of just going as 'extra weight' did not appeal to me at all," she said, but she accepted the offer nonetheless. On June 17, after several delays due to bad weather, Amelia Earhart flew in a plane named Friendship with co-pilots Wilmer "Bill" Stultz and Louis "Slim" Gordon. The plane landed at Burry Port, South Wales, with just a small amount of fuel left. Amelia Earhart was the first woman to fly across the Atlantic Ocean as a passenger and as a pilot. On June 17, 1928, Amelia Earhart was a co-passenger aboard the airplane Friendship with Bill Stultz and Slim Gordon. Stultz was the pilot. Amelia checked the maps and kept records of their speed and altitude. The flight lasted 20 hours and 40 minutes. They landed on June 18, 1828, in the harbor of Burry Port, Wales. Amelia became the first woman to cross the Atlantic Ocean by air. She returned to New York as a hero. She wrote a book and articles, and she gave lectures against war and for women's rights. Amelia wanted to fly across the Atlantic Ocean again -- this time she wanted to fly solo.